Have you ever wondered what it would be like if Hollywood made original movies? The Black List is a website that features the best unproduced screenplays selected by Hollywood executives. While some scripts have gone on to become feature films, the Black List founder, Franklin Leonard, discovered another unique way to make screenwriter’s dreams come true. 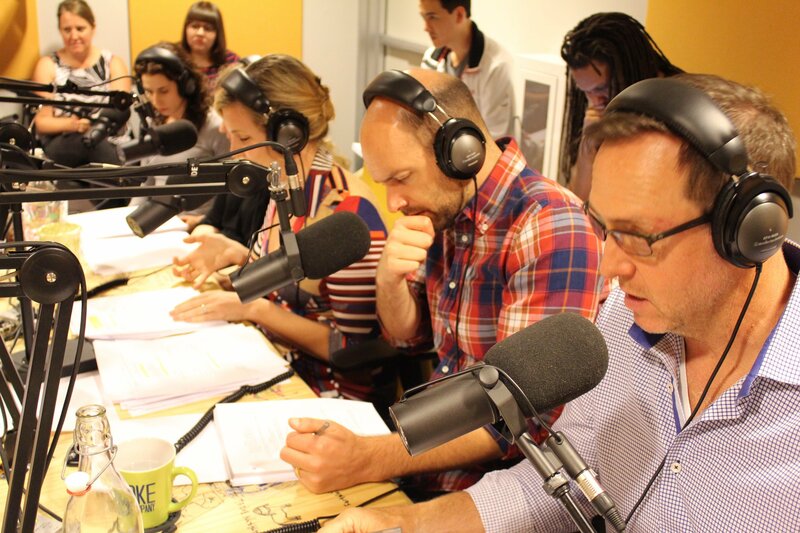 Black List Table Reads premiered on EarWolf in 2015. Running for three seasons, this podcast pulled professional actors together to create full movies for listener’s ears. With gripping stories and intricate sound design, the impressive production hailed in well-known actors such as comedian Aisha Tyler, Shazam star Zachary Levi, and Emmy Award nominee Milo Ventimiglia. Leonard also conducted follow-up interviews with writers so listeners could gain further insight on the stories and their creators. You can enjoy dozens of these “ear movies” on Soundcloud and the Black List website. A love letter to Hitchcock films, fans of the master of suspense will be spellbound by this case of mistaken identity. In a fictional retelling of Alfred Hitchcock’s life, the young filmmaker visits Los Angeles for the first time where he is falsely accused of murder. As he is pulled into a frenzy, Hitchcock must race to prove his innocence in a plot that intertwines elements from North by Northwest and other of his famous films. This unconventional love story centers around famed quarterback Jody Thornson questioned about a scandalous videotape. While he tries to ward off allegations, the dark secret about his sexuality also get threatened. As he loses grip on life, Jody takes comfort in a close friend, who happens to be an ex-football player. How far would you go to get your kid into a good school? When rival parents learn only one child can get into a prestigious elementary school, they begin sabotaging each other’s lives. In this comedy from screenwriter Kevin Oeser, nothing is off limits when it comes to securing your kid’s future. While Black List Table Reads is not currently scheduled for a new season, there are similar podcasts you can listen to and give your support. Dead Pilots Society gathers actors to read unproduced TV pilots and Homecoming is a scripted drama series starring Catherine Keener, Oscar Isaac, and David Schwimmer. Give them a listen and, who knows? Maybe Hollywood will take a chance and bring your favorite ear movie to life. Know any other podcasts similar to Black List Table Reads? Let us know down in the comments.